Outline of the talks I’m doing for Mac Mania along with a revised schedule for the shows and guest hosts – who will need your recordings! Knightwise from knightwise.com sends us a recording about the differences in warrantees in the EU from the US. Two interviews form the Mac Computer Expo – Boinx iStop Motion for iPad from boinx.com and Dolly Drive for online backup from dollydrive.com. Kevin 2.0 brings us a review of LoseIt! from loseit.com and the iPhone app from iTunes Store for iOS to help you lose weight. In Chit Chat Across the Pond we’re joined by Bert Monroy from bertmonroy.com who paints with light. Hi this is Allison Sheridan of the NosillaCast Mac Podcast, hosted at Podfeet.com, a technology geek podcast with an EVER so slight Macintosh bias. Today is Sunday October 21, 2012 and this is show number 389. Well I’m finally getting close to done on my presentations for Mac Mania. I think I’ve whined about it before but I have to do six NINETY MINUTE presentations – UNIQUE presentations. I’ve done an awful lot of public speaking, but generally it’s around 45 minutes with 15 minutes for questions, and there’s only ONE talk. 6 of them at double the time – that’s crazy talk! Now how many of you are yelling at your iPods that I’ve just listed SEVEN talks? If you are, you get points for being able to count. Captain Neil and I decided that the iOS photography and the Video Conversion for iOS ones didn’t have enough beef to keep people entertained for 90 minutes, so we made those two half sessions. The only reason I’m sane today is that I got a LOT of help from a few people putting these together. Bart helped me take my garbled pile of ideas into a coherent story on security, adding a lot of great ideas to it along the way. Steve Stanger met pretty much gave me the outline on how he would give the talk on iOS photography. The hard part about that one is that you could easily just stand up there and list off photography apps and features from each one, but would anyone actually leave there with better skills to use their iOS device to take and process photos? Probably not. He helped me get a workflow plan together that I think will work quite well. The last one we’re working on still is the DVD conversion for iOS talk, and in that case I enlisted Steve to figure out what I should say, again doing a workflow. We’ve got a plan but we still have a ways to go on it. Now Steve is going to record all of these sessions on the ship so hopefully we’ll be able to get them up online when we get back. If nothing else I’ve got some great fodder for future talks! I submitted a few of them to Macworld hoping to get to do a Tech Talk again this year – one that doesn’t involve me having to do it blindfolded! I will definitely be putting the presentations up online too so when we get back I’ll have all that ready for you too. If by any chance you are going to be in the Sydney area on November 6th, we’re planning a meetup with Leo, Don, Sal Saghoian and me so keep an eye on my tweets for more info. Now you may be thinking, “gee Allison, that’s swell that you have this awesome trip you’re going on, and that’s swell for all the people going who get to hear the talks, but what about US while you’re gone?” Well of course I’m not going to leave you in the lurch! On November 11th, Bart will host and Allister Jenks will host the November 18th slot and I’ll be back for November 25th. We’re still working out the logistics on how this will work out but I can tell you for SURE that they’re going to need your recordings to fill the show. So dust off your mic’s and dig through your apps and gadgets and come up with recordings. If you’ve never done a recording for the show before, maybe now is the time to make your debut! I created a page on podfeet.com called Record Your Own Review – you can get to it from the podfeet menu bar, or by going to the link in the shownotes. In there I give you guidelines on how long it should be (3-5 minutes), how to record, what equipment you’ll need, format for the recording and a reminder about sending over the script you use (if any) and links. What we haven’t worked out yet is how we want you to send the submissions in and where, so stay tuned. Bart and Allister will not be doing live shows (yes, they’re chicken), but the NosillaCastaways can still sit around in the chat room at 5pm on Sunday nights – it’s not like they listen to me anyway! The chat room is always there ready for playtime. There might also be some variability on when the show actually comes out – since we have timezones from Ireland to Florida to New Zealand – they don’t even share the same day! Ok, one FINAL announcement, and I’ll remind you on Twitter and in next week’s show, the live show the weekend before we leave will not be on Sunday, it will be on Saturday the 3rd of November. You really should subscribe to the NosillaCast Calendar if you want to keep track of all this. I put a link in the shownotes to the Google Calendar. You must COPY not click this link and then in your calendar tool of choice, paste it into the subscribe section. Ok, enough with the public service announcements – let’s start the show with a recording from Knightwise about warranties. Knightwise sent us a message about the warranty policies in the EU. It’s illegal for Apple to offer a 1 year warranty for their products + AppleCare, 2 year is the law. I think the world would be perfect if we could pick and choose the coolest stuff from each country. I want the warranties from the EU, I want cheap cell plans like Ireland, but I want no roaming charges across thousands of miles like the US, and then throw in Internet speeds like the cities in South Korea, …wouldn’t that be wonderful? At the Mac Computer Expo Steve and I had the great pleasure of getting to know Olliver Breidenbach from Boinx software. We went wine tasting with him, went out to dinner with him, we even let him be our chauffeur for the evening. We did actually take a break from all that fun to do some tech stuff – I got to interview him on the show floor to talk about their newest product, iStop Motion for iPad. Here’s the audio from that interview, and the video is also embedded over in the shownotes as well. Check out iStop Motion for iPad at boinx.com. Hi Allison, Kevin 2.0 here with a review of an app that I find extremely useful. I don’t know about you, but I am constantly trying to keep that pudge around my middle from a full-on outbreak into obesity. That’s where the app I’m reviewing comes in. It’s called Lose It! and it does a great job of helping me keep my weight under control as well as helping me lose that temporary weight gain from holiday or vacation periods. First, how to get it. Lose It! is available in the AppStore and I believe it’s free. It runs on the iPhone and the iPad although because it’s not customized for these platforms, the interface on the iPad is not as cool as it could be. It’s basically the same as the iPhone, but scaled to iPad size. I do have to say that my wife uses the iPad interface while I mostly use the iPhone interface and we’re both happy with what we’ve got so don’t take this as a negative, just that it could be better. When you first open Lose It!, you will be presented with the option of creating an account. I recommend doing this because it will enable you to sync information across your various devices. It will also enable you to use the Motivate feature in which you share your progress towards goals with selected other members. The initial screen creating an account shows the My Day screen and across the bottom of the app you’ll see a list of menu options. There are a number of cool features but I’m going to focus on the best ones and leave the listeners to explore the others on their own. Now the hard part. If you haven’t weighed yourself in a while, that’s the first step you need to take. So man (or woman) up and get on that scale. Then touch the Goals menu button. You’ll be presented with a menu into which you can put your starting weight and a goal weight as well as some information about whether you’re male or female, your height, etc. If you’re happy with today’s weight and just want to maintain it, your goal can be the same as your current weight. You can also decide that you want to lose up to 2 pounds a week in ½ pound increments. At the bottom of that choice screen you will see the amount of calories you can eat on a daily basis to maintain your weight. Bad news ladies, being a guy pays off here. My wife is roughly two-thirds of my weight and gets to eat about two-thirds of the calories I do. Anyway, play around with your goals remembering that to lose a pound a week you have to lower your intake by roughly 550 calories per day. 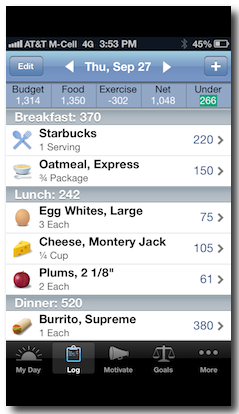 Once you’ve set your goal, it’s time to start using the app to track your food intake. Select the My Day option and you’ll be presented with a graphic that shows todays consumption – it’ll be zero so far – as well as your caloric budget for the day. Notice at the top that you can change the day as well as get weekly and nutrient views. Then there are two buttons: one to Add Food and one to Add Exercise. More about the exercise one in a little bit. Select the Add Food menu item and you’ll be shown a screen asking you to select what meal you’re going to enter food for. Pick one and you’ll be presented with several options. You can search the application database for foods but there are a number of other methods you can use. One of the most useful is to scan the barcode of an item to find it. I use this quite often for things like yogurt, beer, etc. that are packaged foods. Using My Foods you can select from a list of all foods you’ve eaten so far and you can copy all or part of a previous meal. I use this one at breakfast a lot since I tend to eat almost the same thing during the work week. You can select from a large number of brand name and/or restaurant foods and if you need to, you can create a food, say from a recipe that you use where you know the calories but it’s not in the database. As you enter foods you will see that at the top of the screen there’s a food budget as well as how much you are under or over, with under in green and over in red. A tip – sometimes you know you’re going to blow it, say when you’re going out for a nice dinner. You can use these menus to pre-enter that meal and then plan your other meals for the day so that you don’t totally lose the bubble by offsetting the meal that’s going to go over the top. There are some interesting motivational aspects to this app. I’ve found that my snacking and “I’ll have a little taste of that” behaviors have almost disappeared. I just don’t want to add those things into the app and see that half a cookie I just quote tasted unquote cost me 75 calories. And because the app will track exercise as well as food, you really see what exercise could buy you in terms of additional food intake. There is nothing that will motivate me to get off the couch today like entering an exercise I am trying to talk myself into doing into the app and seeing what it does to today’s calorie budget. I am a big bike rider and there are days I actually can be in negative calories most of the day! Even going for a 30 minute walk can give you a hundred extra calories to play with. So make sure you take advantage of this option. Those are the basics and in the interest of time, I’m going to stop there other than to say that there are a lot of other cool features that can make managing your weight fun and effective. Thanks Allison and I’ll add my plug for the Nosilla Castaways group that meets virtually on Sunday evenings. It’s a really fun way to feel like part of the show! Thanks Kevin for a great review! One of the reasons I love this review is that because of LoseIt! I lost 13.5 pounds using it! I read an article a while ago about a study that said that people who count anything lose more weight than people who don’t count something. They said you can count calories, or carbs, or points like weight watchers and you’ll lose more weight than if you don’t. I did figure out something you can measure that doesn’t work though. It turns out that weighing yourself every day doesn’t help you lose weight. I even tried weighing myself TWICE a day and I still didn’t lose weight! As Kevin 2.0 mentions, adding in exercise on LoseIt! gives you calories you can eat. I bought a FitBit a while ago, which measures your exercise, calculates calories burned, and then actually syncs that information over to LoseIt! This combination is dynamite. It makes me walk more, run more, crank up the elliptical, and eat less. It REALLY works! Kevin’s 100% right – if you have to write everything down, you won’t eat that 1/2 cookie. One thing Kevin didn’t mention is that LoseIt! is also on the web so if you’re away from your devices you can jump in and check calories or enter them on the site and it all syncs up across your devices, even Android! Go check it out at loseit.com. Check out Dolly Drive at dollydrive.com. I really have to get in gear and do some cloud backup – it’s the one kind of backup I’ve never done. When I get back from the trip, I’m going to give Dolly Drive a spin. get it? spin a drive? Bert Monroy is an artist who paints with light, using Photoshop. Unlike affected artists who sneer at those less talented, Bert spends a great deal of his energy and time teaching. Through his podcast Pixel Perfect on Revision 3 (http://revision3.com/pixelperfect/photodrawing)I first saw him when he simply showed how to make wood. Out of a blank screen. I could read his bio but I’d rather have him just talk to you. Before 1984 did you use paint? if yes…paint is different than light – was that a hard transition? Tell us about your tech gear (go crazy here! Find Bert Monroy at www.bertmonroy.com and Lynda.com search for Bert and on Facebook.Lynda.com/bertmonroy a service well worth paying for but you can see some free episodes (marked in blue). And here comes the big note about EU Regulations: Very rarely will the law that is enacted as a result of an EU Regulation be exactly the same in all parts of Europe. Each EU country will have implemented that directive, 1999/44/EG if you must ask, slightly differently – so there is a minimum each country had to implement and some countries will have been more pro-consumer than others. Germany unfortunately took the pro-manufacturing stance, and from what Knightwise tells us, it must be that Belgium took a pro-consumer stance. So around here, after the first six months it is you, the consumer, who needs to prove that the item was defective at the time of sales and unless you are a genius, that will be near impossible. And that’s why the EU is both good and bad – they define a minimum standard, some countries will only enact the minimum, others will do better. So from now on I will go to Belgiums, for Mussles & Fries (Moules Frites) and Hardware purchases with superior warrantee – if only Beligum was closer.